Fulwell Mill is a grade II* listed tower mill. It is the only working tower mill in the North East! There has been a windmill on this site for some time and Fulwell Mill wasn’t the first! An earlier mill is evidenced on a map dated 1785. Fulwell Mill was built in the early 1800s for Matthew Robson Swan. 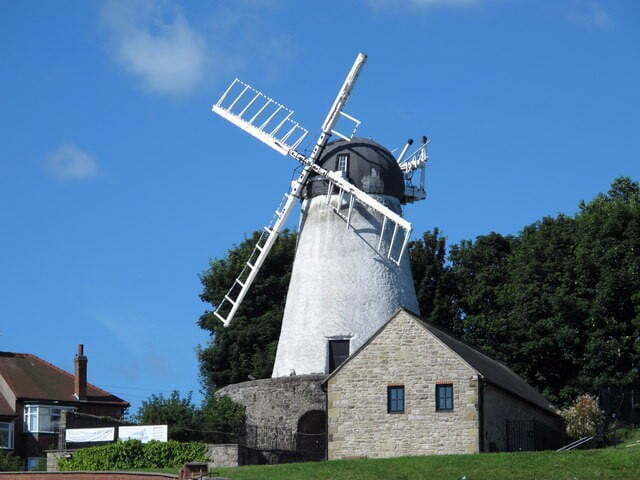 Fulwell Windmill started to appear on the Sunderland skyline in 1806 and became the familiar landmark we know today when opened in 1808. Built for Joseph Swan out of magnesian limestone from the adjacent quarry, it retained its links with the Swan family for many years. It was built circa 1808 and restored in 1951, 1987, 2000 and again in 2018! In 1834, John Fuller was the miller, then, during the 1840s, the Dodd family ran the mill. Subsequent millers include D. Coulson and William Moody. At some point ownership later passed to the Church Commissioners, but continued to be milled by the moody family; as William’s son, also called William, operated the mill until 1949. A gas engine was installed circa 1900 and the sails were removed. The 2016-2017 restoration project was a partnership between Sunderland City Council, which provided £310,000 in funding and Historic England, who awarded £99,200 of grant funding, towards the £400,000 costs of repair and restoration. The cap of Fulwell Mill was lifted by a 200-tonne heavy crane and placed on top of the tower of the historical building. Skilled, traditional craftsmen from specialist millwright Owlsworth IJP completed the cap and fantail. The cap and fantail weigh approximately 10 tonnes, are based on the original, early 19th Century design and are made of oak. Various events are planned to entice visitors, so swing in and show your appreciation!